Why does the 37-year-old mayor of South Bend, Indiana, think he's eligible to run for president? 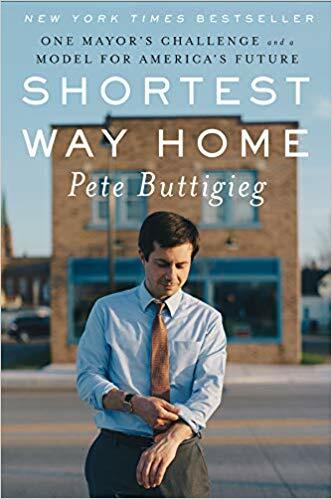 This book provides "Mayor Pete's" rationale and credentials. Collaborating with Notre Dame University on technology like "Smart Sewers" (pp. 177-8), which Buttigieg describes as "College Town 2.0". Data-driven policy instead of the traditional political method of intuition: Buttigieg worked for the McKinsey management consulting firm and applied its data-driven method, but came to appreciate balance with intuition (p. 195). Buttigieg collaborated with Pence and other Republicans (Indiana is a red state, with places like South Bend representing liberal havens amid hundreds of miles of conservatism). For example, Buttigieg and Pence made a bipartisan collaboration on the "Regional Cities Initiative" (pp. 207-8). Buttigieg claims that he has more government executive experience than Donald Trump: Buttigieg has been mayor since 2012, while Trump has only been in government since 2017. He also claims military experience, having served eight years as a Navy lieutenant (the same rank in the same branch as JFK, one might note). And Buttigieg also ran for the chairmanship of the Democratic National Committee in 2017 � he lost, but met all the major national Democratic players in the process (pp. 305-7). Is that enough to run for president? At this writing, Mayor Pete is definitely the "flavor of the month," because the first quarter fundraising reports just came out, and Buttigieg reported $7 million in contributions, placing him solidly in the top tier of dozens of candidates. Whether that flavor-of-the-month translates into a serious campaign, or fizzles out just as the mainstream media learns to pronounce his name, is yet to be seen.